that can also boast a Picasso. Within this frame classic and modern at the same time you can enjoy the restaurant Borgo San Jacopo, where you can taste a cuisine of the highest quality. 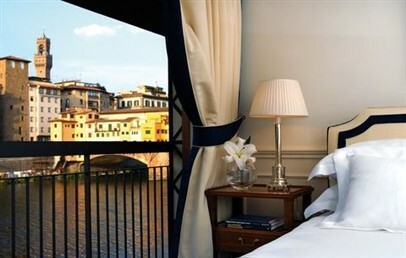 The Hotel Lungarno, as underlined by its name, is located along the Arno River, in the fascinating old center of Florence. Its location is an exclusive and luxury additional value because it offers to its guests romantic views and give you the chance to experience and discover the city from its oldest and most authentic historical heart. The Hotel Lungarno, easily reachable from Rome, Milan and Naples, is just 10 Km far from the Amerigo Vespucci Airport, the main one of Florence. Designed and furnished by the Florentine architect Michele Bönan, the 5 stars Hotel Lungarno reflects the refined and elegant style of the Lungarno Collection. It is worth mentioning the 400 artworks of Picasso, Cocteau and famous Italian artists that guests can admire in their rooms or in the common areas. Elegance and breathtaking views are the main features of the 59 rooms and 19 suites of the Hotel Lungarno. Each room offers a refined, precious examples of Tuscan craftsmanship, Wi-Fi and Tuscan Soul complimentary toiletries by Salvatore Ferragamo. Guests can choose different room typology: Relaxing, Prestige and Deluxe Arno rooms; the private apartments Studio, Studio Arno and Studio Suite Tower and finally, the exclusive Cocteau, Picasso and Bueno Suites. 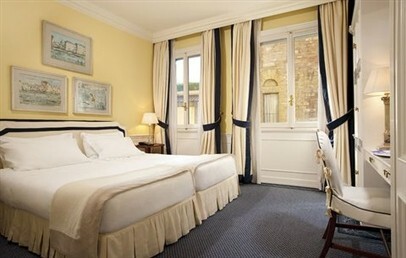 Relaxing Room, 21 sqm characterized by yellow and ivory colours, fine linen, original artworks and with Oltrarno view. Prestige Arno, 21 sqm characterized by blue and light blue colours, marble bathroom, work desk area and with River Arno and Ponte Vecchio view. Deluxe Arno, 30 sqm characterized by ancient furniture, artworks of Italian artists, marble bathroom with Arno and Ponte Vecchio view. Some rooms have also a terrace. Studio, 37 sqm characterized by large and bright rooms with marble bathroom and Oltrarno view. Arno Studio, 35 sqm characterized by antique furniture and famous Italian artists artworks. 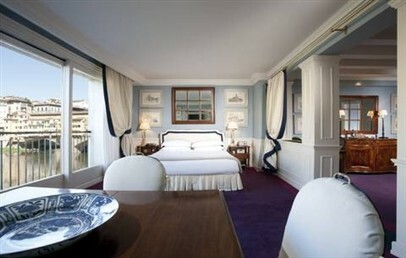 The bedroom is separated by the living area and both face the Arno River. 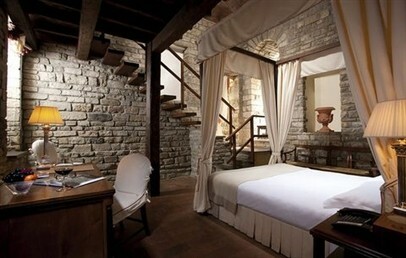 Studio Suite Tower, 37 sqm located in the medieval tower and arranged on two floors. It is characterized by stone walls, vaulted ceiling and cotto floor. 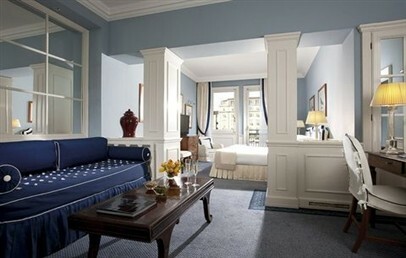 It consists of double bedroom with four-poster bed, sitting area and marble bathroom. 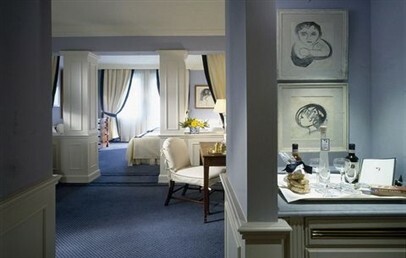 Suite Picasso, Cocteau and Bueno, 42 sqm characterized by the artworks of great artists of the 20th century. They consist of a double bedroom with sitting area, marble bathroom with bathtub and shower and balconies or terraces with Arno river view. Guests can book wellness treatments and massages at the White Iris Beauty Spa by Daniela Steiner. The Spa is located in the Hotel Continentale within walking distance from the Lungarno Hotel. Borgo San Jacopo is the restaurant of the Hotel Lungarno in which the best Tuscan and Italian cuisine is offered by the Chef Beatrice Segoni. 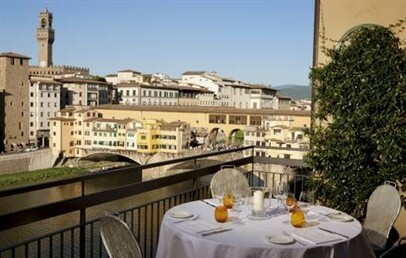 The restaurant is elegant and overlooks the Arno river. For a coffee or a cocktail, guests can enjoy the trendy Picteau Bar. The staff is at your disposal to organize excursion, shopping tours, visits to museums and art galleries, candle light dinners, work meetings and special parties with catering service. 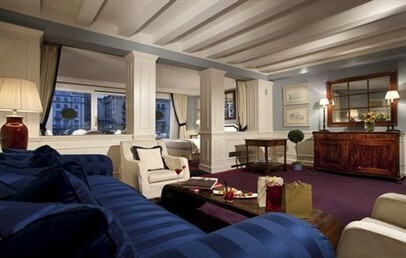 Special discounts for the guest of the Lungarno Hotel are guarantee at the Salvatore Ferragamo boutiques. 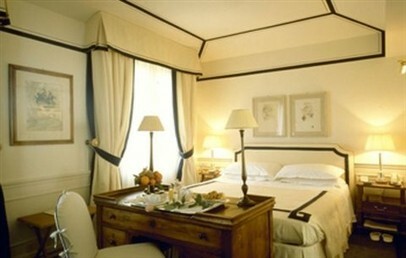 Elegant double room characterized by yellow and ivory colours and furnished with refined linen and original artworks. The bathroom is equipped with shower and complimentary toiletries by Salvatore Ferragamo. The Relaxing rooms face the Oltrarno area. 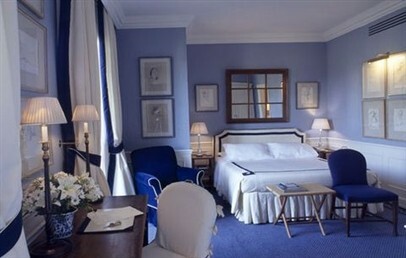 Elegant double room characterized by blue and light blue colours and furnished with refined linen. It consists of a, work desk area with easy chairs. The marble bathroom is equipped with shower and complimentary toiletries by Salvatore Ferragamo. 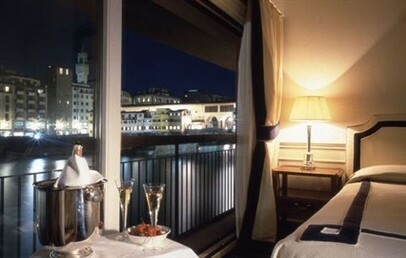 The Prestige rooms face the Arno River and the bridge Ponte Vecchio.. Elegant double room ocated in the upper floors of the Hotel. They are characterized by ancient furniture and artworks of Italian artists. ItThe marble bathroom is equipped with shower and complimentary toiletries by Salvatore Ferragamo. 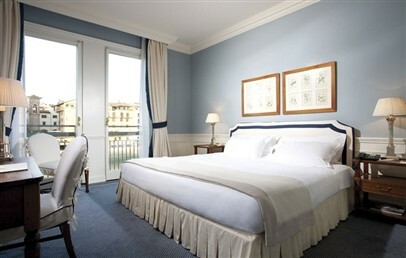 The Deluxe rooms face the Arno River and the bridge Ponte Vecchio. Some of them have also a terrace. Large and bright double room characterized by warm and elegant atmosphere. The marble bathroom is equipped with shower and complimentary toiletries by Salvatore Ferragamo. The Studio accommodations overlook the Oltrarno area. Large and bright double room characterized by blue colour, ancient furniture, artworks of Italina artists and by warm and elegant atmosphere. It consists also of a comfortable living are. The marble bathroom is equipped with shower and complimentary toiletries by Salvatore Ferragamo. The Studio Arno accommodations overlook the river. 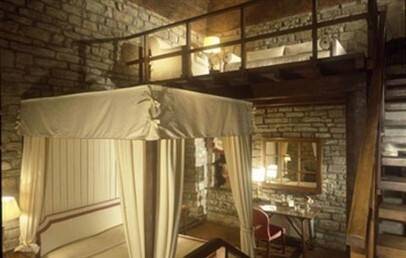 Large and bright double room located in the medieval tower from the thirteenth century. It is characterized by stone walls, vaulted ceiling and cotto floor. The double room with four poster bed is separated by the living room with sofa bed settled in the loft. The marble bathroom is equipped with shower and complimentary toiletries by Salvatore Ferragamo. The Studio Suite Torre offers a panoramic view of Florence. Beautiful and fascinating Suite dedicated by the artworks of great artists of the 20th century: Picasso, Cocteau and Bueno. They consists of double room and living area. 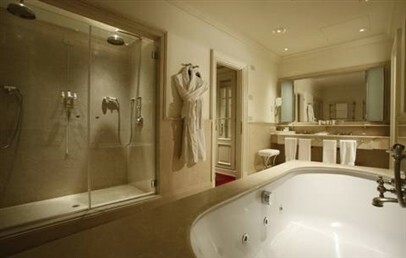 The marble bathroom is equipped with shower, tub and complimentary toiletries by Salvatore Ferragamo. 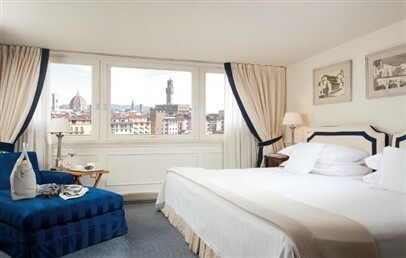 The Suite offers a Arno view.